Stung by accusations of racism over his depiction of blacks and the Ku Klux Klan in the groundbreaking Birth of a Nation (1915), movie pioneer D. W. Griffith determined to answer his detractors with Intolerance, a multi-stranded narrative detailing the unceasing battle between ’hatred and intolerance vs. love and charity’ through the ages. He succeeded in creating a classic that arguably transcended Birth of a Nation, but which, because of a structure that proved too sophisticated for its audience, failed badly at the box office, and ironically marked the beginning of Griffith’s slow and painful decline. Having ploughed much of his own fortune into the film, it’s huge financial losses forced the formerly independent director back to the artistic and creative constrictions of the Hollywood studios. The Biblical and Huguenot episodes make up only a short portion of the film’s gargantuan (nearly three hours) running time, with the lion’s share given over to the Babylonian sequence which, while perhaps not quite as entertaining as the modern story, benefits from some truly spectacular sets and battle scenes. 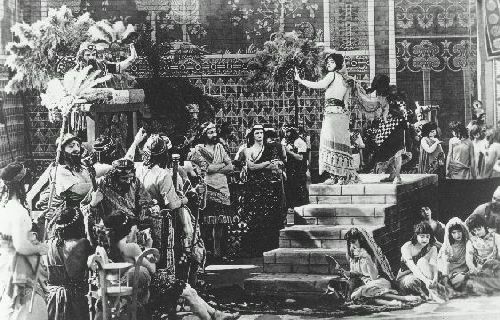 This sequence also features a marvellously warm and unexpectedly modern performance from Constance Talmadge as The Mountain Girl, whose crush on the young Belshazzar inspires her to don a suit of armour and enthusiastically engage the enemy when Babylon comes under attack from the forces of Cyrus. Sadly, Mae Marsh’s performance in the modern tale is as poor as Talmadge’s is impressive. She simpers and coos, and pulls faces resembling those of the mildly dim-witted rather than the sympathetic victim of injustice for which she strives. Even allowing for the era in which the film was released, her performance is below standard. Griffith is widely credited with inventing most of the basic cinematic techniques that are still in use today, although it’s probably more accurate to say that he established and made popular techniques which had been in sporadic use for some years. He was a pioneer in every sense of the word, and while his films are often difficult to watch, plagued as they are by a sticky sentimentality that some audiences today might find difficult to digest, his skill and versatility as a director are very much in evidence in Intolerance. 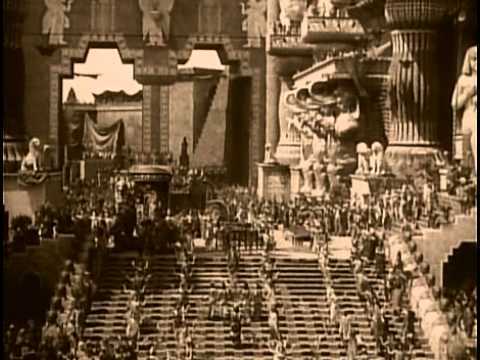 The tracking shot used on the stupendous set at the beginning of the Babylon feast sequence for example, looks commonplace today – and is, in fact, easy to overlook completely – but was something special back in 1916, a subtle technique that not only drew the audience into the debauched revelling of the huge crowd, but focused its attention on the details that Griffith felt were the most important.